. : Farm Forest Line - Buffer Strips for Nutrient Trapping :. Research has shown that seasonal flowing drainage lines and small creeks contribute the bulk of the nutrients to a river system. Buffer strips of grass and trees along these drainage lines and waterways can prevent some of the nutrients leaving pastures and croplands. On grazed land the exclusion of stock from the waterways is a another simple and effective strategy. While this may mean additional off-stream watering points are required, it may also make mustering easier and overcome the risk of losing stock, which may become trapped in mud. Nutrients may travel in overland flow (runoff) either in solution (dissolved) or attached to soil particles. Sediments are best trapped by dense ground covers such as grass. Deep leaf litter layers are useful but are at risk of being washed into the waterway as well. It is therefore important to allow a thick sward of grass or other ground covers to develop under or beside trees. 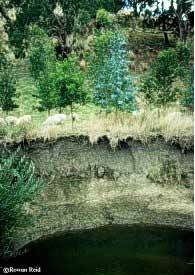 A dense planting of eucalypts will lead to bare ground and should be avoided. The effective width of a buffer strip depends on the volume and rate of overland flow. Since the land close to drainage lines is often the most productive, it is impractical to expect farmers to fence off wide belts along all their drainage lines. A simple survey of the banks will identify low-lying points where overland or sub-surface flow is likely to occur. These areas would require much wider belts than banks that are high and stable. The temptation to adopt a minimum width should be avoided, as it will clearly be insufficient in some areas and unacceptable to farmers in others. In order to harvest the nutrients trapped in the buffer strips, whole tree removal and grazing may be required. Simply locking up the area may ultimately lead to the buffer strip being ineffective as a nutrient trap because of nutrient saturation. Wetlands and pools in seasonal drainage lines are ideal nutrient traps for harvesting soluble nitrogen. Water plants and trees growing around the ponds can use the nitrogen for growth. Again, harvesting in some form is required to extract the nutrients from the site.